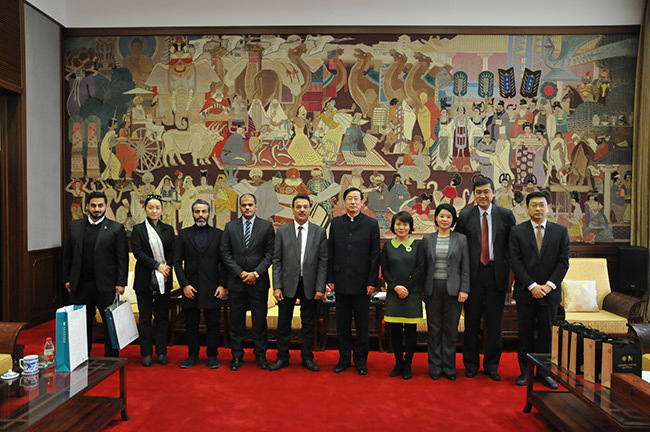 On the afternoon of 28 November, Rao Quan, Director of the National Library of China (NLC), met with Dr. Abdulkareem Al-Zaid, Deputy Supervisor General of the King Abdulaziz Public Library (KAPL) of Saudi Arabia, and his delegation. On behalf of the NLC, Rao Quan thanked the KAPL for receiving the invitation to join the “Silk Road International Library Alliance”, and introduced the development plan of the Alliance to Dr. Al-Zaid. He hoped that the KAPL could make full use of its regional influence to promote the development of the Alliance in the Middle East. Dr. Al-Zaid introduced background information of the KAPL to Rao Quan, and highlighted the construction progress of the Arab website of the Arab-China Digital Library Project, which work was in charge of the KAPL. He hoped to exchange views with the NLC in terms of various works in the next stage for the Project. Rao Quan committed that the NLC would continue its good work for follow-ups of the Project, and suggested both sides to strengthen communication and collaboration with regard to website resources update, metadata backups, regulated legal authorizations, media coverage and cybersecurity management etc. Dr. Al-Zaid agreed with the suggestion, he committed that the KAPL would work closely with the NLC in joint efforts to implement the Arab-China Digital Library Project, to make the portal website of the Project an important window for demonstrating the outcome of Chinese and Arab civilizational exchanges. After the meeting, Dr. Al-Zaid and his delegation visited the National Museum of Classic Books.